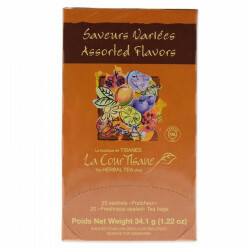 La CourTisane fruit and herbal infusions with 10 assorted flavours. La CourTisane fruit and herbal infusions with 10 assorted flavours: blueberry, cranberry, lemon, linden flowers, gentle evening, camomille flowers, passionfruit, refreshing mint, wild blackberries, ginger pear. Blueberry: rosehips, hibiscus flowers, blueberry leaves, lemongrass herb, orange leaves, orange peels, natural flavours, lemon peels, blueberries. Cranberry: hibiscus flowers, lemongrass herb, birch leaves, natural flavours, citric acid, cinnamon bark, star anise, licorice root, cloves, cranberries. Lemon: lemongrass herb, rosehips, verbena leaves, orange peels, natural flavours, citric acid, lemon peels, roasted chicory root. Gentle Evening: camomille flowers, lemongrass herb, spearmint leaves, hibiscus flowers, skullcap herb, cinnamon bark, natural flavours, orange flowers. Passionfruit: rosehips, hibiscus flowers, apple granules, orange peels, natural passionfruit flavour, citric acid. Refreshing Mint: spearmint leaves, peppermint leaves. Wild Blackberries: hibiscus flowers, rosehips, apple granules, lemongrass herb, natural flavours, blackberry leaves, orange peels, cinnamon bark, citric acid, licorice root. Ginger Pear: ginger root, orange leaves, rosehips, lemongrass herb, orange peels, natural pear flavour, apple granules, linden leaves, roasted chicory root, citric acid. Use one tea bag per cup. Add boiling water and steep 3 to 5 minutes. Enjoy!